All right folks! 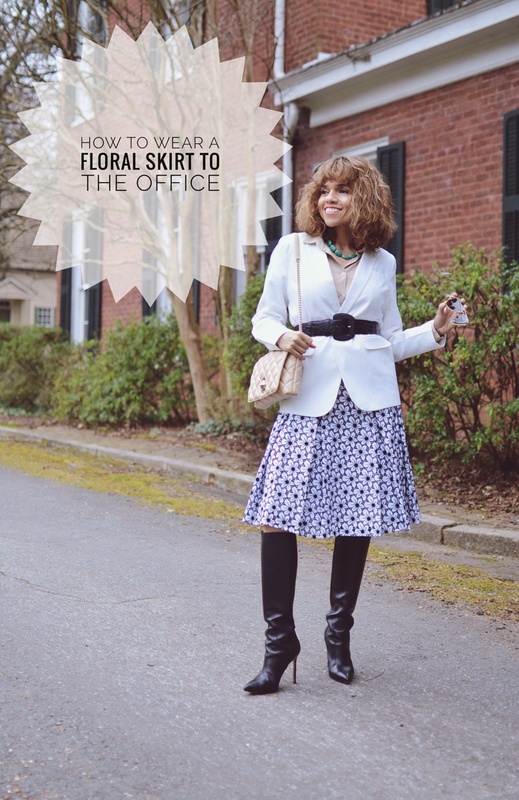 Here is my Monday Work Outfit with the same floral eyelet skirt that I styled for Sunday brunch on my last post. If you didn't have the chance to read the post, click here to check it out. One of the most important mottos of my blog is to be able to #dressfun but without the needing an extensive wardrobe, ...which means that pieces with a lot of versatility are the key. 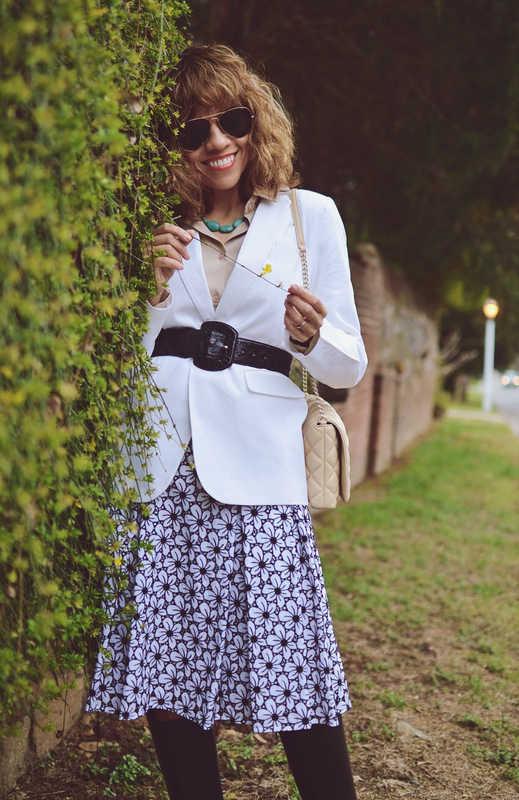 A Spring floral skirt like this (with a classic silhouette and a neutral colored print), you know it's going to be a great candidate for work or playtime. Today, in order to inject formality to this eyelet skirt, I paired it with a classic blazer, blouse, shoes and, bag. This time, instead of belting the skirt, I decided to accentuate my waist with the same cinch that I used for the weekend. The first days of Spring and Autumn are perfect for wearing our dresses and skirts with our boots. Yes, those days are fantastic because we can wear the best from the warm and cold seasons all at once. With that in mind, I styled this godet shape skirt for a transitional weather. So now you know why instead of wearing my skirt with pumps, I decided to pair it with knee-high boots that, together with the belt, gave this skirt a fabulous strong contrast. I'm sure by now you've noticed that I used garments with neutral hues to compose this look. I did this purposely in order to make my turquoise jewelry stand out, serving as a small pop of color. Thanks so much for reading my post and don't forget to subscribe in order to be the first one on getting my blog posts updates. Skirt: c/o Brooks Brothers/Blazer: c/o JD Williams/Blouse: c/o The Fable/Boots: Manolo Blahnik/Bag: Kate Spade/Sunglasses: Ray-Ban/Jewelry: Vintage/Belt: Vintage.